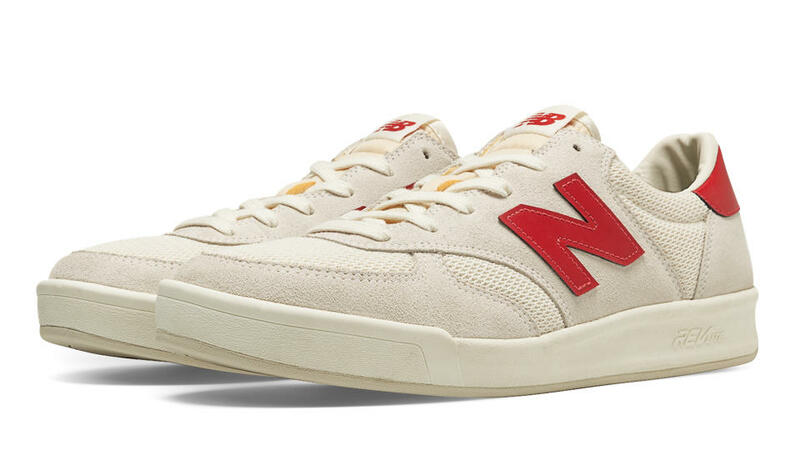 With the US Open currently underway, we are going to take a look at the tennis side of New Balance, and to begin, we’re going to break you in gently by taking a look at the New Balance CRT300, and specifically, this “Vintage” Pack. Both these models have been reinvented a little, so that rather than being strictly for the court, they can be used for every day wear. We’ll take a look at the New Balance CRT300 specifically for now though, and the difference with this shoe is that it features the revolutionary REVlite midsole. The REVlite midsole is NB’s new cushioning system that provides lightweight comfort, and trust me, when you get a pair of the CRT300 in hand, you’ll realise just how lightweight they are. This particular pack comes in three colourways, all built using suede and mesh, and sporting a distinctively classic vibe. Also, the great thing about the CRT300, certainly in comparison to the CT300 is that these models are a lot lot cheaper, and the REVlite makes them a lot comfier, so it’s a win-win all round. All three of these pairs are currently available via New Balance, with two of them even being on sale! Click the link above to shop the full Court Classics range, or click on any of the pictures to take you directly to that shoe!